We have a pretty small bathroom, with nonexistent counter space. 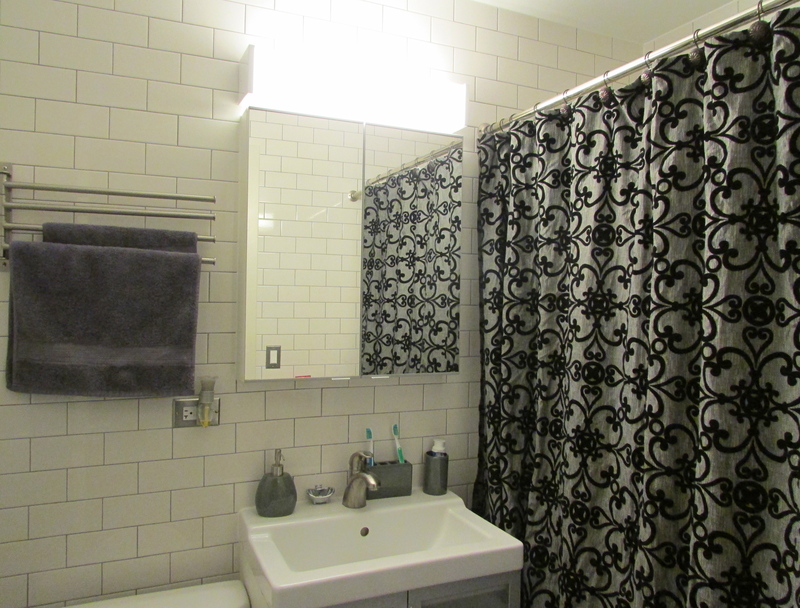 Luckily, we have some storage under the vanity to hold bathroom supplies, and a fairly deep medicine cabinet. Between the three of us, we’ve divvied up precious real estate like so: I get the shelves behind the left mirror panel, and the guys get the shelves on the right side. Admittedly, I get more space than either of them, but the truth is, I have more stuff, and so I’ve had to be restrained when it comes to how much stuff I can actually shove in there without sacrificing functionality. There’s nothing fun about a packed medicine cabinet that you have to empty just to reach the one product you want all the way in the back. What made the edit? See below. The middle shelf, a.k.a. the hair product and face-product overspill shelf. 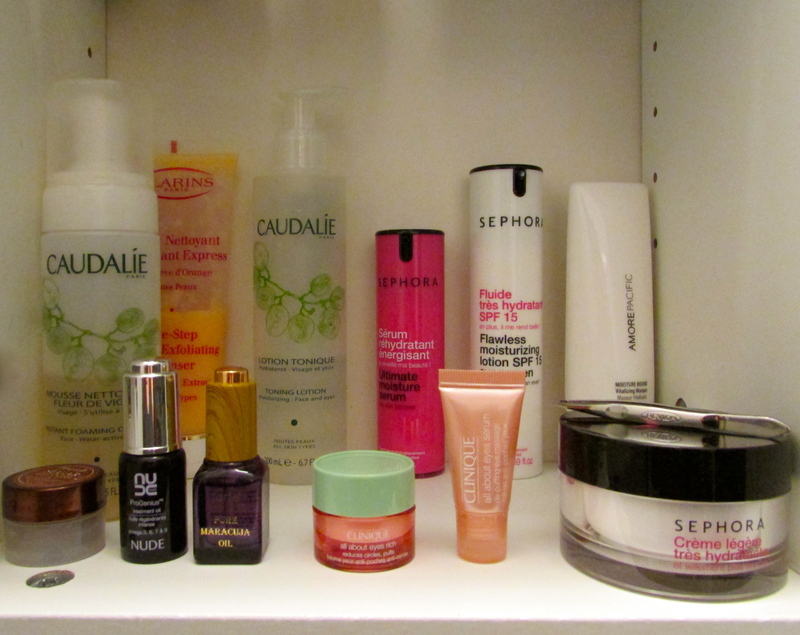 The other half of the shelf is the face-product overspill, a.k.a. the things I couldn’t fit in the bottom shelf. The infamous bottom shelf which houses my current skincare favorites. Over the past year or so, I’ve really started to focus more on my skin. I’ve never really had serious acne problems, save for a couple of greasy years in high school, but I didn’t want to take that for granted longer than I already had, so I developed a routine. I have combination skin that tends to get dry on the cheeks and oily on the T-zone. It also tends to get quite dull and rough in the winter if I don’t exfoliate. 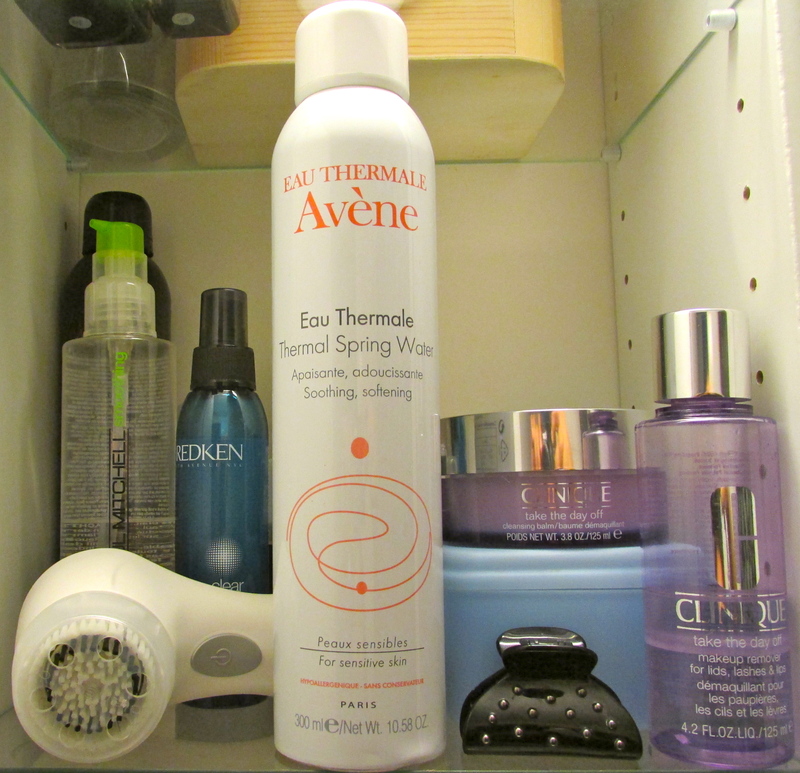 In the morning, I wash my face with the Caudalie cleanser or I skip cleanser all together and just spritz the Avene thermal spring water to wake my skin up if my skin is feeling a little dry. I then apply serum on my face and neck, followed by a lightweight moisturizer with spf. Then I put on whatever makeup I’m wearing for the day. I use the Clarins exfoliating cleanser once to twice a week, usually on Saturday and Wednesday at night. I use my Clarisonic once a week with it, usually on Saturday night when I have the time to really do some cleaning. It’s generally not a good idea to exfoliate more than once or twice a week, and since I have combination skin, I find that this frequency, mixed in with the Clarisonic once a week works well to control my oily spots without drying out other areas too much. The mornings after I exfoliate are usually the mornings I skip cleanser altogether and just go for a quick spritz of water on my face. At night, the routine is a little more involved. First, makeup removal. For eyes and lips, I use the Clinique lids, lashes & lips, which takes everything off in a snap. I then rub the cleansing balm ( a recent addition) all over my face to remove the rest of my face makeup. I rinse the removers off, sometimes with a muslin cloth, then I apply cleanser and work it in, and then rinse again. I then apply the toning lotion with a cotton pad to catch any last bits of stray makeup. When the toner has dried, I apply my nighttime moisturizer, the Amore Pacific moisture bound vitalizing masque, which is more of a gel consistency and richer than my daytime lotion for optimum moisture. This stuff smells so good (like bamboo water) and makes my skin feel incredibly hydrated when I wake up the next day. Lastly, I apply eye cream. This last step is something I just started doing, so I’ve been trying out the Clinique samples. I like them so far. Now to the odds and ends. The fresh lip scrub is crucial for when my lips are really beaten up and need some extra TLC. The instant moisturizer from Sephora is another moisturizer I use for when I’m just staying in and don’t need a moisturizer with spf. Sometimes I also use it at night after I’ve taken my makeup for some before-bed moisturizing, and then I’ll use the Amore Pacific one a couple of hours later right before I go to bed. I also have two face oil samples I’ve been testing out here and there. I prefer the feel of serum to face oil, but I do like the extra moisture they give, and they’re so easy to layer under other moisturizers or makeup. Whew. That’s it. It seems like a lot looking at it, but as with any routine over time, it becomes second nature. I’ve got this down to under 3 minutes in the morning and under 5 minutes at night, give or take, just add an extra minute for Clarisonic days.